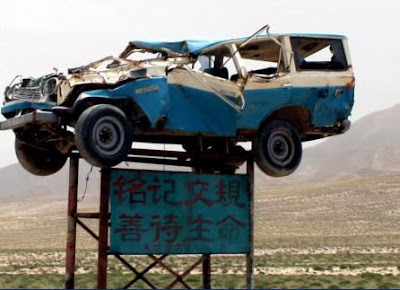 A traffic warning sign with a wrecked car on top. 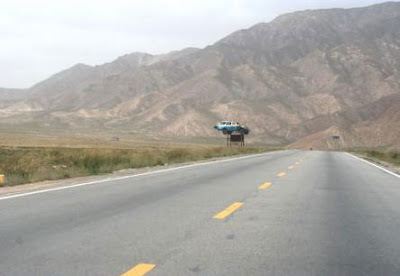 It is located along the Qinghai-Tibet railway in China and the words on the sign translate to "bear in mind the traffic rules and take good care of your life". These are also quite common in Iceland. I think a few too many foreigners go and hire a car, then get caught out by the less than excellent roads. Still they do help you think about driving sensibly! This is certainly more effective than just putting up a sign.